How Long Does Invisalign in Farmington Take to Complete? Teens and adults looking for a less time-consuming orthodontic treatment have a lot to gain with Invisalign in Farmington. Not only can patients keep their image, diet, and brushing habits with Invisalign; they can also do it in less time than traditional braces. However, the length of treatment can vary on several factors, so it’s important to know what they are before starting. To learn how to make the most of your Invisalign treatment, keep reading. After your dentist determines that Invisalign is appropriate, they’ll take impressions of your smile and use that data to create your series of clear aligners. These are produced in an offsite Invisalign lab and usually take a few weeks to make. Once complete, you’ll come back to the office to pick up your series of aligners. It will take a day or so for you to get used to your first pair. You may experience a slight change in speech at first, but luckily this will disappear the longer you wear the aligners. You’ll wear them for about two weeks (or however long your dentist prescribes) and then switch to the next pair. Each pair will represent another stage in your orthodontic treatment, so it’s very important to commit to switching to the next pair when the time comes. The average length of treatment is 12 months, much shorter than the average for braces which is typically between 18 and 24 months. However, this can vary depending on the complexity of the realignment case. 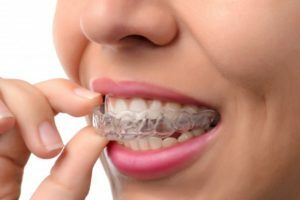 Patients with more severe misalignment or bite problems may need to wear the aligners longer. Since you’ll be visiting the dentist every 6 to 8 weeks to make sure your treatment is on track, your dentist can make any adjustments as needed. Your dentist cannot stress enough how important it is to keep wearing your aligners throughout the day and while you sleep. For effective results, they should be worn for at least 22 hours a day, only removing to brush and eat. The less time you spend wearing them, the longer treatment will take. Have your next pair of aligners with you if you don’t plan on seeing your dentist for a while. This will also prove helpful if your current pair is lost or damaged in any way. Keep your aligners in their container when you brush or eat. This prevents them from drying out as easily and helps you remember to retrieve them. You don’t want to accidentally throw them away, especially when you’re eating out. Avoid eating, drinking (other than plain water) and chewing gum while wearing your aligners. Rinse and sanitize them every day to remove food particles and plaque that collect on them. These can interfere with your realignment. Orthodontics in Farmington has never been simpler thanks to Invisalign! Schedule a consultation with your dentist to learn more! Dr. James Cole earned his Doctor of Dental Surgery degree from the Baylor College of Dentistry. There are few things he enjoys more than helping patients regain confidence by improving their misaligned smile with Invisalign in Farmington. To learn more about his practice, contact him through his website. Comments Off on How Long Does Invisalign in Farmington Take to Complete?